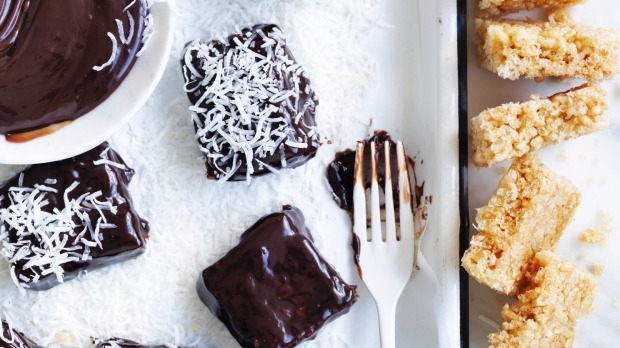 ​​Everyone loves a lamington, but here's a recipe that swaps light and fluffy for chewy and crunchy. 1. Heat the coconut oil, caster sugar and rice malt syrup (or glucose) in a small pan over medium heat for five minutes until the mixture starts to change colour. 2. Pour over the rice cereal in a heatproof bowl and stir to combine. 3. Press mixture firmly into a lightly oiled slice pan or deep baking tray and cool to room temperature. 5. Slice into 5cm squares. 6. To make the ganache, heat the chocolate, coconut oil and pouring cream in a small saucepan, stirring until the mixture is melted and glossy. 7. Stick a skewer into each puffed rice square and dip it into the ganache to coat. Tap off the excess ganache and sprinkle with shredded coconut. 8. Allow to cool and serve.